Years of experience in running values workshops has reinforced the belief that it is better to introduce the language of values using 50 key-values rather than the 128 values The 50 key-values are not an abbreviated list of the 128 values. Rather, they are a grouping of the 128 into 50 sets of related values. Even though this is the way the Minessence Group has to date approached the gradual introduction, in workshop situations, of the 128 values. We are currently planning to completely drop the key-values approach and replace it with a short list of representative values chosen directly from the 128 values. 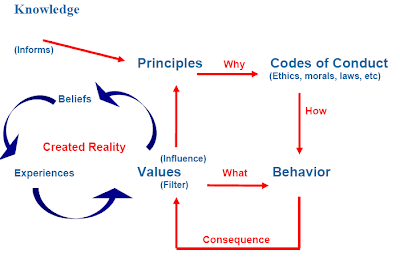 What's the Difference Between Values, Ethics & Principles? Copyright 1988-2011 Minessence Group. Picture Window theme. Powered by Blogger.